Buried in the minutiae of the budget, is language that could cut some communities off from the funds they need to revitalize. The provision in question would force some struggling communities to come up with their own funds if they hope to secure federal grants for community redevelopment. Many of the communities are already on the economic knife-edge, and would likely lose out on needed funds if the provision passes. In North Carolina, the Community Development Block Grant (CDBG) program has been considered one of the most effective and flexible economic development tools for local communities, addressing a host of needs ranging from affordable housing to business creation and retention. The program’s focus on citizen participation and goal of explicitly benefiting low to moderate-income households have helped boost communities statewide. However, changes proposed to G.S. 143B-437.0 concerning (CDBG) would drop language that currently include 16 counties (Jones, Clay, Perquimans, Chowan, Swain, Mitchell, Yancey, Montgomery, Ashe, Cherokee, Macon, Yadkin, Pasquotank, Person, Jackson, and McDowell) amongst the most distressed counties (as defined by G.S. 143B-437.08) not requiring a 25% percent local funding match. While not the 25 most distressed counties in North Carolina, these 16 counties were exempted from the funding match to encourage revitalization in areas that feature populations less than 50,000 and poverty levels more than 19%. There is no question that these 16 communities, mostly isolated from urban centers, face struggles similar to the 25 most distressed in North Carolina, struggles that unmatched CDBG funding could help address. In fact, seven of the sixteen counties (Jones, Clay, Mitchell, Yancey, Montgomery, Ashe, and Cherokee) received CDBG funds between July of 2016 and June of 2017, totaling $4,495,027 for projects ranging from sewer and water infrastructure improvements in Murphy to building uplift in Hayesville. According to this proposed change, similar awards in the future would require 25% percent or $1.1 million to be contributed from those counties. This is an unnecessary burden that could force local governments to pass on opportunities for revitalization. Moreover, this provision could come back to haunt local communities during the next recession. The existing statue recognizes that many rural communities need help when economic downturns occur, which is why the existing language would allow small rural counties with elevated levels of poverty to access CDBG funds without a local match regardless of whether they rank in as one of the 25 most distressed. If the current proposal goes through, many more rural communities could be scrambling to find local matching funds precisely when their coffers are being drained by the next recession. A new BTC report highlights how the new two-year budget passed by state lawmakers continues to choose austerity and failed trickle-down economics over broadly shared prosperity. House and Senate leadership garnered the needed votes to override Gov. Cooper’s veto of the budget, resulting in approval of the budget. Under the budget, total state spending for the 2018 fiscal year (FY18) will remain below 2008 pre-recession spending. This marks nine consecutive years that state spending as a share of the state’s economy has declined. Under the budget, overall spending for FY18 – which will run from July 2017 through June 2018 – is a 3.1 percent increase over the prior fiscal year. Beyond additional state funding provided for state employee pay increases, year-over-year net new spending for FY18 is a modest 1.4 percent above spending for the prior fiscal year. 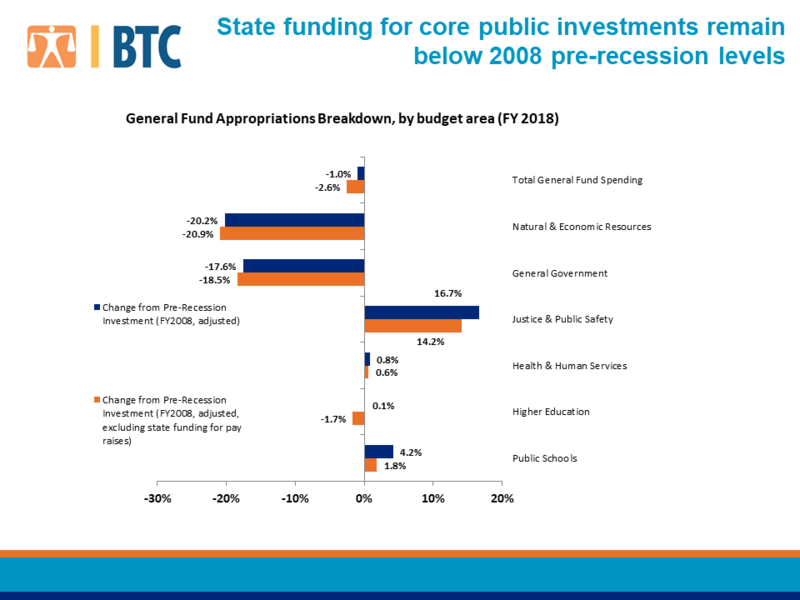 Consequently, nearly all core areas of the state budget remain below or near pre-recession spending levels when adjusted for inflation. “State expenses are expected to grow faster than revenue starting in 2019, according to a five-year budget forecast. “The report by nonpartisan legislative staff offers a half-dozen suggestions for dealing with future shortfalls, including not paying for inflationary increases in spending items such as state salaries; using money unspent from previous years; calling off planned income tax cuts; or increasing the sales tax rate from 4.75 percent to 5 percent. From ensuring a high quality education for all students, to promoting healthy and safe communities, to pursuing economic development initiatives that target rural and distressed communities, the budget falls short of ensuring broadly shared opportunity and prosperity. The new BTC report highlights missed opportunities to make adequate public investments so that all communities across the state can thrive. Cedric Johnson is a Policy Analyst with the Budget & Tax Center, a project of the NC Justice Center. Today, the NC General Assembly passed The Disaster Recovery Act of 2017 (SB 338). The bill allocates $100 million to help Eastern North Carolina recover and rebuild from the devastating effects of Hurricane Matthew. Causing massive flooding and damage in 50 counties in the Eastern part of the state, the storm displaced thousands of families and impacted hundreds of thousands of homes and business. Ultimately, there was an estimated $2.8 billion in damages and another $2 billion cost in lost economic activity. This is the second round of disaster recovery funding the state has pursued. In a December special session, the General Assembly passed the Disaster Recovery Act of 2016, allocating $200.9 million. Since then, Governor Cooper, as well as North Carolina’s Congressional delegation, worked hard to secure a federal commitment to fulfill the state’s unmet need. In May, the Trump Administration announced that they would only allocate $6.1 million of the $930 million North Carolina had requested. The Disaster Recovery Act of 2017 is a key step in attempting to close the gap left wide open by the federal government. In this round of funding, $20 million will be allocated to addressing housing needs, including the repair of homes for low-income homeowners and renters. Another $20 million will go to the Department of Agriculture for dam, soil, and water systems repairs, and $30 million will go to infrastructure projects managed by local governments and non-profits. $2.7 million will help the Community College System deal with enrollment declines resulting from the storm, and, finally, $22.3 million will be allocated as a match for federal disaster grants. Although this round of funding is not enough to address the unmet need or the total costs of damages incurred in Eastern North Carolina, it is an important step. If we are to help Eastern NC not only recover, but to become resilient, state lawmakers will have to continue to make these types of investments in the years to come. If you want a program which “advocate(s) actions which increase opportunities for historically underutilized businesses and promotes diversity and inclusion in state government procurement and contracting” to not do its job, you do it quietly. The Historically Underutilized Business (HUB) Office was established by Executive Order 150 in an effort to remedy past and ongoing discrimination in the procurement and contracting markets in North Carolina. After being codified in 2001, the initiative aimed to 1) increase the amount of goods and services acquired by state agencies from HUB firms, 2) make progress towards eliminating barriers that reduce participation of HUB firms, 3) encourage purchasing officers and relevant personnel to identify and utilize HUB vendors and contractors, 4) educate HUB firms on doing business with the State of North Carolina and 5) provide resources for HUB firms. The Locke Foundation was having fun with math yesterday in an effort to defend a fiscally irresponsible package of tax cuts in the final budget lawmakers are close to approving. Why? because—wait for it—they would like you to think they haven’t just given another green light to tax cuts that further pump up the gains for wealthy taxpayers while making virtually no progress in addressing the tax load carried by middle- and low-income taxpayers. The average tax cut received by the taxpayer in the top 1 percent (whose average income is $1 million) compared to the pre-2013 tax code is nearly $22,000, which is more like 96 times the tax cut that the middle-income taxpayer in North Carolina will receive each year as a result of tax changes since 2013. The average tax cut for middle-income taxpayers is $225. Once the final budget passes, one in three of net tax cut dollars goes to the top 1 percent of taxpayers, whose average income is a million dollars. Under the final budget, nearly 80 percent of net tax cuts since 2013 will flow to the top 20 percent of taxpayers once all the latest tax code changes are fully implemented. When we look in isolation at this year’s tax plan, policymakers may have paid attention to their egregious track record when it comes to addressing the tax load for most North Carolinians but they have fallen short of setting our tax code right. Their final tax plan still gives the wealthiest taxpayers the majority share of the net tax cut compared to current law. And their full track record shows their failure to put middle- and low-income taxpayers front and center as they make their tax policy decisions. Budget writers and supporters don’t want to talk about all the changes that have happened since 2013, the loss of the personal exemption and other credits and deductions that benefited working families, including the Earned Income Tax Credit and the Child and Dependent Care Tax Credit, as well as the broadening of the sales tax. Still worse, with this final budget they continue to push us further towards a single revenue option in addressing future downturns—raising the sales tax, which will inevitably mean asking more from low- and middle-income taxpayers again.